Home » Obama can't say it enough: Iraq war over » US President George W Bush Jr. US President George W Bush Jr. 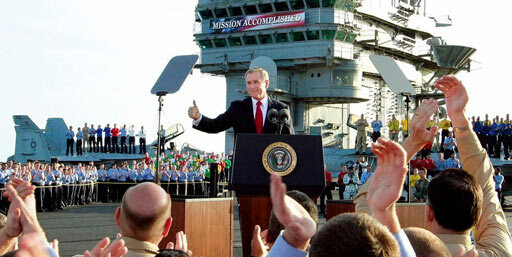 In this picture dated May 1, 2003, then US President George W Bush Jr. stands beneath a banner that reads 'Mission Accomplished' (in Iraq) on-board the USS Abraham Lincoln aircraft carrier and declared that “major combat operations” in Iraq had ended. He also made time this week to speak about Iraq to regional television stations serving military communities, most of them in states targeted by his re-election campaign. Without question, the ending of a war is moment for any president to reflect with the country. Yet even Obama noted people have seen this one coming for a while. Since George W. Bush was president, in fact. Bush was the one who struck a deal with Iraq to set Dec. 31, 2011, as the final day of the war. Yet it was Obama who accelerated the end of the U.S. combat mission when he took office, shifted attention to Afghanistan, and decided to leave no troops behind in Iraq after this year. The final U.S. forces will be out in days. This, in essence, is Obama's mission accomplished: Getting out of Iraq as promised under solid enough circumstances and making sure to remind voters that he did what he said.